Whitehaven Beach on Whitsunday Island is the most iconic and well-known beach in the Whitsundays, if not the whole of Australia! The swirling sands of Hill Inlet and the stunning white stretches of shoreline that make up Whitehaven make it the picturesque landmark seen in pictures and postcards all over the world. 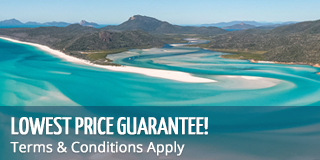 Many boat tours visit Whitehaven Beach, making it one of the most visited beaches in the Whitsundays. Luckily its size always makes you feel like you have a little corner of the beach to yourself, as crowds are often very spread out over its 7 kilometres! Boathaven Beach is a man-made beach found in the town of Airlie Beach. It is away from the main centre of town and offers some peace and quiet without having to venture too far! During stinger season, the beach has a stinger net to offer a safe swimming environment and is a popular spot for many locals and tourists to swim and relax in the sun. Catseye Beach on Hamitlon Island is a man-made beach in the heart of the island that available to the public as well as guests. From this beach you can snorkel, swim, or rent water sports toys such as paddleboards, kayaks and windsurfers. Horseshoe Bay Beach is located in Bowen and gets its name from the natural horseshoe shape of the beach. It's a great escape from some of the other crowded beaches around Australia and offers privacy and seclusion. The beach is flanked by rocks and backed by trees giving it a very oasis like feel! Airlie Beach is the small beach found in the heart of the town of Airlie Beach, where it gets its name. It's a great beach to escape to if you want a few minutes sea-side in the middle of a busy day! It's found just off the main street and has views of the many yachts, boats and islands in the Coral Sea.